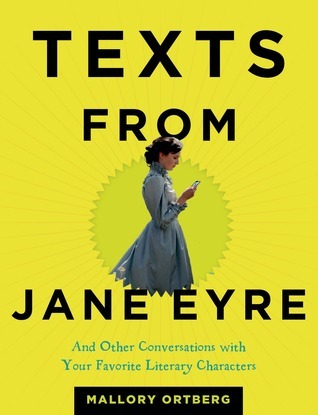 Texts From Jane Eyre by Mallory Ortberg turned out to be exactly what I needed: quick to read, easy, and funny. Most importantly on this busy and stressful weekend I didn’t have to put much brainpower into it. 🙂 This would make a really great stocking stuffer for a book lover. I’ll admit most of the poet’s texts went over my head but there was more than enough of a selection that anyone who enjoys reading would find something. Some characters and books seem absolutely perfect for breaking them down into texts. Daisy from The Great Gatsby and Heathcliff and Cathy from Wuthering Heights seemed perfect for this format. Although I have to admit most characters sounded a lot more annoying in text format. Wonder if the texting format doesn’t just bring out the worst in people? My favorites: Daisy Miller, Wuthering Heights, Hamlet, Gone with the Wind, Fight Club and Sweet Valley High (though I don’t remember them being psychos). Like I said not much to it (I read it in less than an hour) but it made me laugh and helped me de-stress so totally worth it!